Looking for a fun and simple sweet treat to make for the family, or something fun to make with the kids? 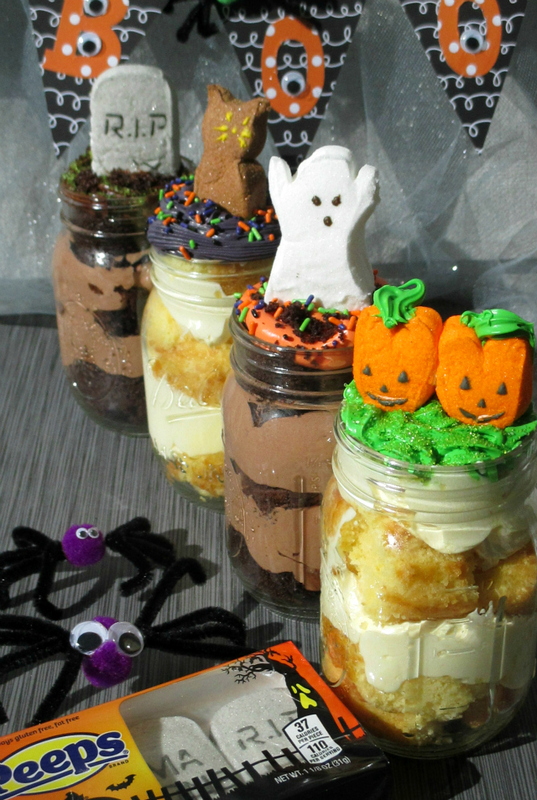 These Halloween Mason Jar Trifle's are perfect! This is such a simple decadent treat to assemble, and they're super cute too! Whether you serve them up at your next Halloween party, or as a special after-dinner treat for the family, everyone is sure to love them. 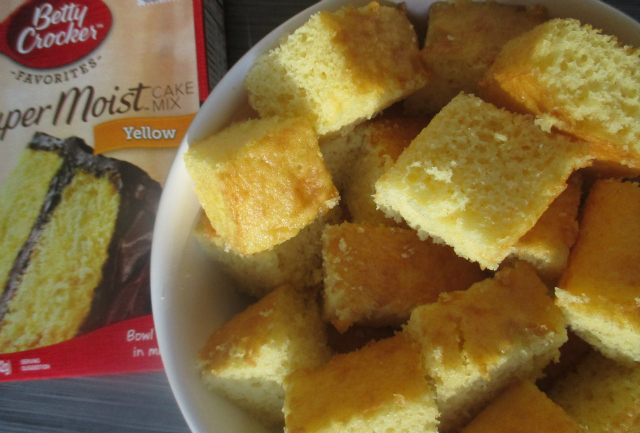 Betty Crocker™ Super Moist cake mixes are amazing! These handy mixes yield light, moist delicious results every time and are available in a variety of flavor choices. I used Super Moist Yellow cake mix and Super Moist Dark Chocolate Fudge cake mix to make the pictured trifles. While some trifles are made with custard, I wanted something lighter to pair with the light moist cake. So, I whipped up a super simple 5 minute mousse. I topped the Trifles off with Betty Crocker Rich & Creamy icing (died fun Halloween colors with Betty Crocker Color Gels), PEEPS® Halloween Marshmallow toppers, and festive sprinkles. Like I said, super cute! Read on for a supply list and to check out the instructions on how to make Halloween Mason Jar Trifle Desserts. 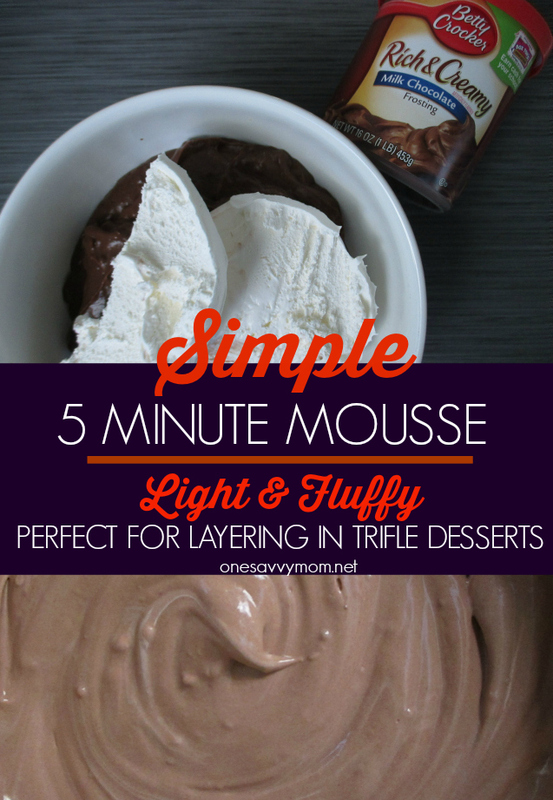 Plus, grab our super simple light & fluffy 5 minute mousse recipe, below. 1 box of Betty Crocker Super Moist Cake Mix - I used Yellow and Dark Chocolate Fudge to assemble the pictured trifles. Optional: Betty Crocker Color Gel -I purchased these in a 4 pack to dye the icing fun Halloween colors. Prepare and bake your Betty Crocker Super Moist Cake according to the instructions on the packaging. Allow adequate time for the cake to cool. Slice the cake into 2 inch cubes. Set cake to the side. Prepare your instant pudding according to the instructions on the packaging. Once prepared, gently fold your frozen whipped cream topping into your prepared instant pudding to create your mousse. 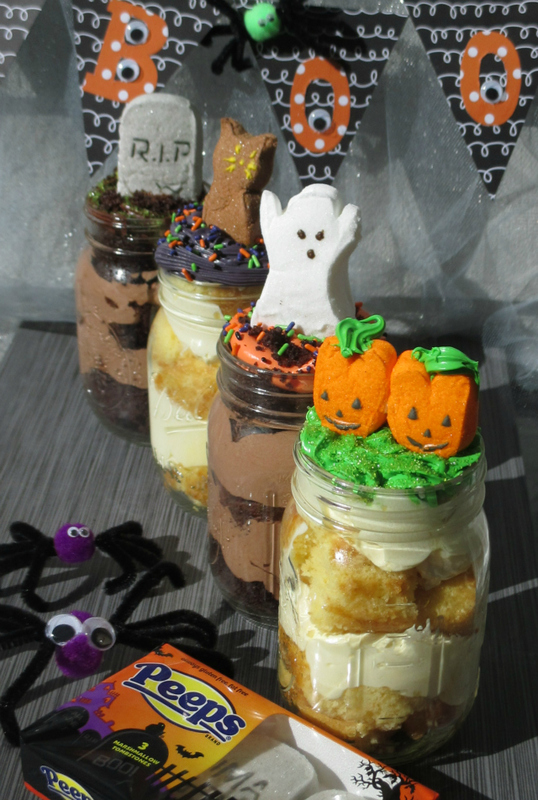 Once your cake and mousse are complete, it's time to assemble your Halloween Mason Jar Trifles. Optional step: dye your Betty Crocker Rich & Creamy Icing fun Halloween colors. To assemble your trifles, start by laying 2 to 3 cake cubes in the bottom of each of your mason jars. Next, spoon a layer of mousse on top of your cake. Repeat the previous steps until you have 3 tiers (or layers) to each of your mason jar trifles. Once complete, top each of your mason jar trifles with Betty Crocker Rich & Creamy Icing. Decorate your trifles with some spooktacular PEEPS Halloween Marshmallow Toppers (available Exclusively at Target), and add some festive sprinkles. 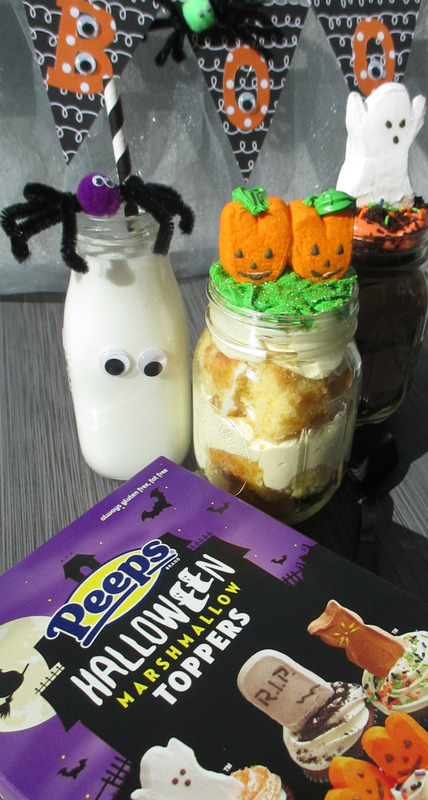 Serve your completed Halloween Mason Jar Trifles with a cold glass of milk & enjoy! 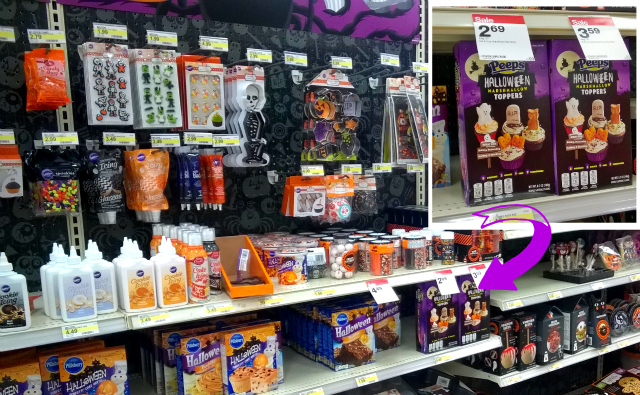 You can find PEEPS® Halloween Marshmallow Toppers Multipack and the Betty Crocker products featured / mentioned in this post at Target stores nationwide. CLICK HERE for more Sooktacular treat inspiration and recipes - share your favorite in a comment below! This looks like a very fun Halloween treat to make for my family and get my son and daughter to make with me. I love chocolate mousse and this recipe is fun to make!